Sleepless is a 2017 American thriller crime action film directed by Baran bo Odar, and written by Andrea Berloff. The film stars Jamie Foxx as a corrupt Las Vegas police officer who sets out against mobsters to rescue his son, T, who they got. Michelle Monaghan, Dermot Mulroney, David Harbour, Tip "T.I." Harris, Gabrielle Union and Scoot McNairy also star. A remake of the French thriller Sleepless Night, the film was released in the United States on January 13, 2017. It received generally negative reviews from critics and grossed $32 million worldwide against a $30 million production budget. While driving Thomas to his soccer game, Vincent is ambushed by Rubino's men, who stab him in the abdomen and kidnap his son, demanding the stolen cocaine back in exchange for Thomas's life. Vincent retrieves the cocaine from Cass, places it in a duffel bag and leaves it in the ventilation shaft of one of the bathrooms in Rubino's casino, hoping he can negotiate his son's release before handing over his leverage. He is unknowingly followed by Bryant, who, now convinced he is a dirty cop, retrieves it and hides it in the women's locker room nearby. Upon learning that the drugs were moved, Vincent is forced to present Rubino with bags of sugar to ensure Thomas's safety, but Novak uncovers his ruse and Thomas is recaptured by Rubino's men, while Vincent manages to escape. Meanwhile, after coming up empty while searching the casino for Downs, Dennison is convinced he's gotten away, and directs Bryant to go home and get some sleep. Bryant gives him the key to the women's locker with the cocaine, and heads for the exit. Vincent enters the casino as a janitor, but crosses paths with Bryant on her way out and chased into one of the hotel rooms. They fight, and he subdues her before revealing he's been undercover on behalf of Internal Affairs for the last two years to dismantle the crime ring within the police department. He knows his partner Cass is a drug-runner, knew details about a previous investigation by Bryant, and is now attempting to find the senior member of law enforcement that is covering everything up. A skeptical Bryant directs him to the locker room to retrieve the cocaine, but the drugs have recently been removed by Dennison. Dennison ambushes Vincent, but is ultimately overpowered and knocked unconscious. Meanwhile, Thomas escapes and steals Rubino's cellphone to contact Vincent, but is quietly being followed by Rubino and his men who allow it all to happen in an attempt to lure Vincent into a trap. Elsewhere, Dena finds out Vincent and Thomas are in danger and heads to the casino. Cass arrives and confronts Vincent about his Internal Affairs involvement, but then saves Vincent from one of Novak's men. He is shot in the process and presumed dead. Vincent infiltrates the casino in a police uniform that Cass brought and finds out Dennison is the mole in the force whilst going through Cass' phone. He discovers Dennison is on Novak's payroll and informed Cass that Vincent was Internal Affairs and needed to be killed. Bryant and Dennison later find a severely injured Cass in the garage. While Bryant checks the vitals of Novak's man, Dennison privately questions Cass on whether Vincent is aware of his involvement and finishes him off when Cass refuses to answer. Vincent and Thomas reunite just as Novak begins shooting up the casino and escape to the parking garage. Meanwhile, Bryant arrests Rubino. Vincent and Thomas attempt to escape in a stolen car, but are ambushed by Novak and his men, leading to a violent shootout. Dena arrives and kills one of Novak's men before Novak corners them. He shoots Vincent in the chest, but Vincent survives and fatally shoots Novak. Vincent then contacts Bryant and alerts her of Dennison's corruption. Realizing he's been exposed, Dennison draws his gun, and shoots Bryant and Rubino and forces the police cruiser they're in to crash. Dennison crawls out of the wreckage claiming Rubino killed Bryant and the driver with a stolen gun before being shot by Dennison, but Bryant has managed to survive and exposes Dennison, who is arrested by the arriving policemen. Vincent and Bryant are taken to the same hospital, where they make amends and congratulate each other on the job. Meanwhile, a corrupt DEA Agent, seen earlier in the film, contacts Novak's father and informs him there's been a problem. Filming began on June 15, 2015, in Atlanta and Las Vegas. The film was originally set to be released on February 24, 2017, but in October 2016 was moved up to January 13, 2017. Sleepless grossed $20.8 million in the United States and Canada and $12.1 million in other territories, for a worldwide total of $32.9 million. In North America, the film was released alongside Monster Trucks and The Bye Bye Man, as well as the wide releases of Silence, Patriots Day and Live by Night, and was expected to gross around $10 million from 1,803 theaters in its opening weekend. It ended up opening to $8.5 million, finishing 8th at the box office. The film grossed $3.5 million of wide release (a drop of 59%), falling to 9th. On Rotten Tomatoes, the film holds an approval rating of 23% based on 56 reviews and an average rating of 4.3/10. 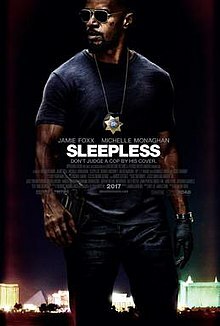 The site's critical consensus reads, "Sleepless wastes a talented cast – and solid source material – on a tired crime drama whose clichés rapidly outnumber its thrills." On Metacritic, the film has a weighted average score 34 out of 100 based on 15 critics, indicating "generally unfavorable reviews". Audiences polled by CinemaScore gave the film an average grade of "B+" on an A+ to F scale, while PostTrak reported filmgoers gave it a 77% overall positive score. ^ a b c "Sleepless (2017)". Box Office Mojo. Retrieved October 7, 2017. ^ Verhoeven, Beatrice. "'Patriots Day,' 'Hidden Figures' to Lead Tight MLK Weekend Box Office". TheWrap. Retrieved January 11, 2017. ^ "Jamie Foxx and T.I. to Star in 'Sleepless Night', Open Road to Finance and Distribute". Variety. ^ a b "Jamie Foxx's 'Sleepless' Cruises To MLK Weekend; 'Before I Fall' Lands In March". Deadline Hollywood. ^ "Jamie Foxx's 'Sleepless Night' Open Casting Call in Atlanta". ^ a b "'Hidden Figures' Stays Smart, But Why Are So Many Movies Bombing Over MLK Weekend?". Deadline Hollywood. ^ "Uni/Blumhouse's 'Split' Is A Hit With High $39M To $40M+; 'Xander Cage' Falls Down". Deadline Hollywood. ^ "Sleepless (2017)". Rotten Tomatoes. Retrieved April 10, 2018. ^ "Sleepless reviews". Metacritic. Retrieved July 20, 2017.